Pristine preowned mens Rolex Datejust II (ref. 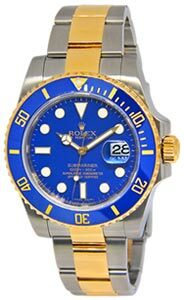 116333; card dated 2010) in 18k yellow gold and stainless steel features a black dial with Roman numerals, 18k yellow gold fluted bezel and 2-tone Oyster bracelet. This is the larger size model (41mm) with the engraved inner bezel. Comes with its box and card as shown .